Treasures : Wonderful antique 1900 ( I think about 1910 because of the silk floral pattern fabric who's typically from this era ) ruffles long skirt . Made of silk , wool ( small part inside the skirt ) and tull with polka dots . Only one or two small holes on the tull but it is very minor . There is a black spot on the skirt ( see photo ) . I think it is a chocolat or coffee spot . 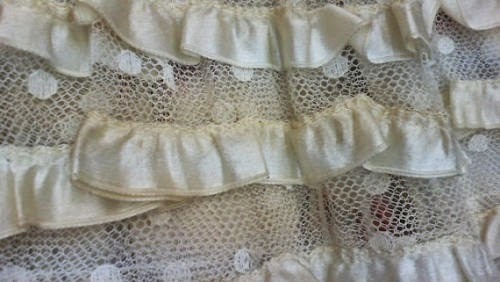 The fabric is all consistent with a Turn of the Century date. Drawstrings were used in skirts- I have an extant bustle gown that is half drawstring, half pleated to a waistband- and this drawstring looks original. I love this!! 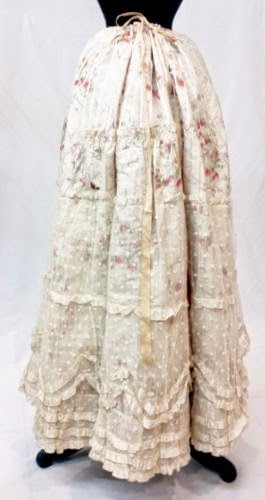 There are several Edwardian petticoats in the Met Museum collections that look very similar to this, with the printed silk fabric and lots of lace. 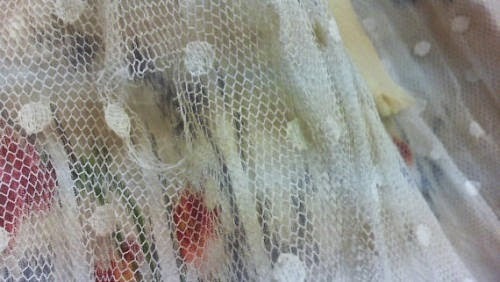 Could this be a petticoat? 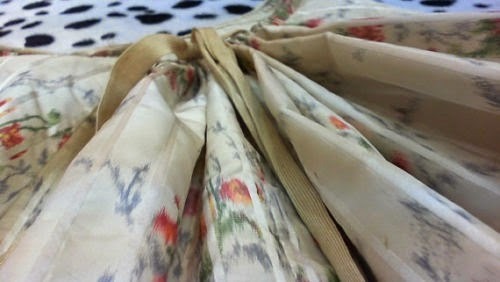 The only reason I hesitate in saying that it could be a petticoat is the silk. Most petticoats are out of cotton with lace at the bottom - where it might show should you need to lift your skirt to get up the stairs. 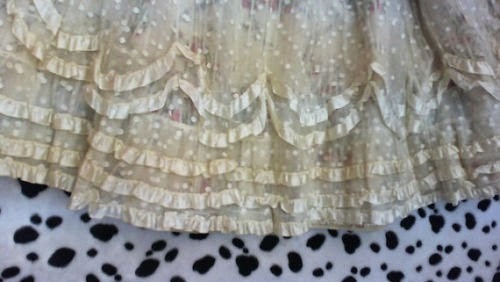 The lace on this is fairly high as well - more like a skirt.